NFPA 20, UL 1008 Listed (File No. E32008), NEMA ICS 227-47, Free Standing NEMA 3R, Front Accessible, Fire Pump Dedicated, Automatic Transfer Switch. These Fire Pump Automatic Transfer Switches are rated for applications of 225 to 800 amperes, up to 600VAC, with interrupting ratings of 35kAIC@480Vac up to 100kAIC@480Vac. The Fire Pump Control accessory includes all features necessary for a Lake Shore Molded Case, Dual Motor, Automatic Transfer Switch (ATS) to meet or exceed NFPA 20 (Chapter 10), U.L. 1008 and NEMA ICS 227-47 requirements for an ATS to be used in a Fire Pump Circuit. 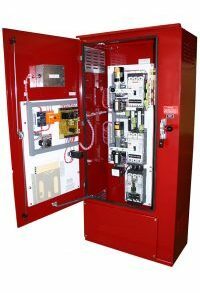 NFPA 20 requires the Automatic Transfer Switch to be a self-contained power switching assembly, housed in a separate enclosure. The transfer switch must be dedicated to the fire pump load exclusively and is both electrically or manually operable and mechanically held. An Isolating Switch, located within the Transfer switch enclosure and externally operable, is provided ahead of the input terminals of the emergency side of the switch.